Olympus has just officially announced the new Olympus TG-5. It is a rugged camera that is waterproof to 15m, shockproof from 2.1m, crushproof to 100kgf and dust proof, featuring a 12MP BSI CMOS sensor, 25-100mm F2-4.9 lens and the company’s TruePic VIII processor. 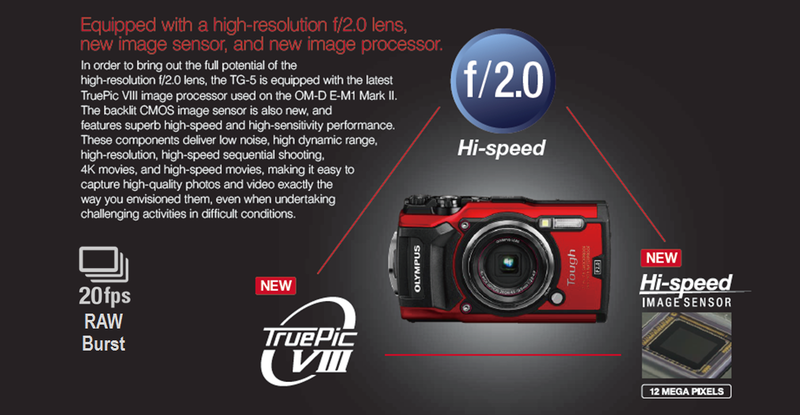 This new camera costs $449, available for pre-order at B&H/ Adorama. It will start shipping on July 3, 2017. This entry was posted in Olympus camera and tagged Olympus camera rumors, Olympus TG-5 on May 17, 2017 by admin.